It took 260 hours to apply this special paintjob. Most of us would find the prospect of driving a McLaren more than special enough – let alone owning one and driving it whenever we want, and all the more so ordering one from the factory to our own specifications. But some discerning customers aren't satisfied by all that. That's what McLaren Special Operations is for. And this one client had MSO paint his 720S in an intricate process to make it stand out from any other. 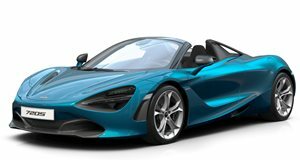 Highlighted in this latest video, this 720S Spider was painted in a three-tone blend that MSO calls Coriolis. The special paintjob melds two shades of blue together with black to make for a rather unique finish. And we bet it looks even more stunning in person. We're sure that kind of personal attention to detail cost its commissioning buyer a pretty penny or two. As it is, pricing for the 720S Spider starts at $315,000. And that's before you tick the boxes on any of the extensive options on offer from both the standard catalog and MSO's nearly endless array of personalization options. You get one heck of a ride for all that scratch, though. With 710 horsepower and 568 lb-ft of torque on offer from its 4.0-liter twin-turbo V8, the 720S Spider will catapult to 60 mph in 2.8 seconds, and won't stop pulling until it's cracked 212 mph.